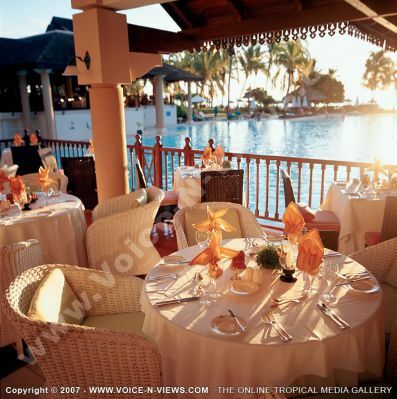 The Sofitel Mauritius Resort & Spa restaurant terrace view. The Hotel has 5 restaurants. ?��Ǩ?�Ming Court?��Ǩ�� restaurant overlooking the huge swimming pool offers Chinese cuisine, ?��Ǩ?�Teppanyaki?��Ǩ�� offers a fine Japanese cuisine, ?��Ǩ?�Le Ravinala?��Ǩ�� the main restaurant offers American breakfast buffet and fine dining along the poolside.